These photos belong to Esther Brouk and were submitted by Bryan Sullivan. 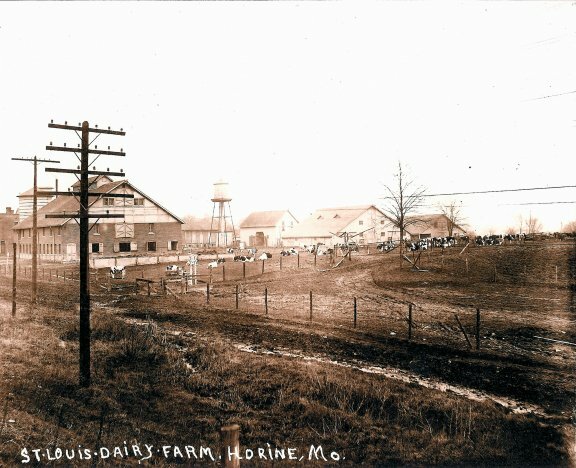 These late 1880 to 1900 +/- photos are from when the Eichorn family moved from central Wisconsin down to Horine, Missouri. 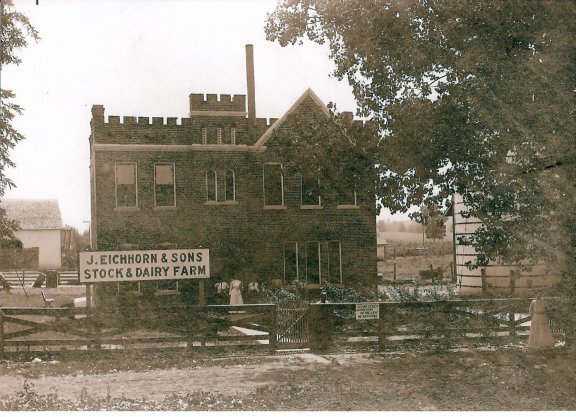 When the Eichorns moved from Horine to Cape Girardeau/Jackson, they tore down the brick house and the brick barn. They sold all of the brick. The timbers from the barn were used to build their new barns down south. 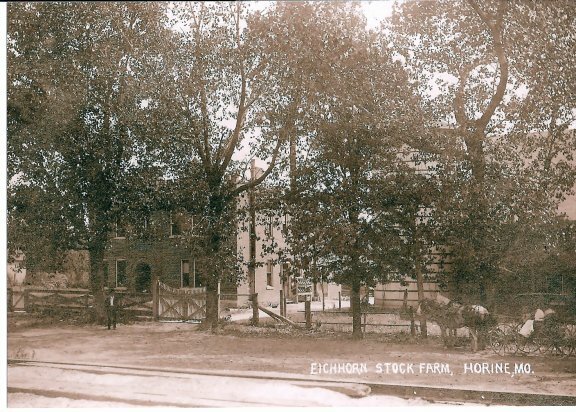 Neighbors [at the bottom of the hill] to the Eicholz farm were the Brouks and Sullivans. 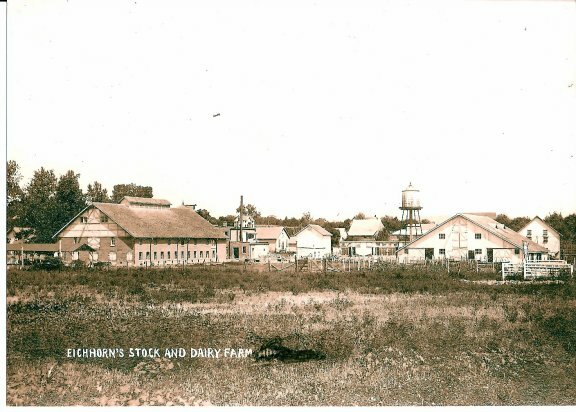 The muddy road in the foreground would now be Festus/Horine Road. Herky/Horine (known as Big Bass) would intersect in today's photo. Alta Stanglein Luhn's house (grandmother of Bryan Sullivan) is visible on the hill in line with the smokehouse flue. There is no barn at the top of the hill. Today, all that remains from this photo is the concrete where the gate is placed. Only the driveway remains today. Steam locomotive headed south towards DeSoto. 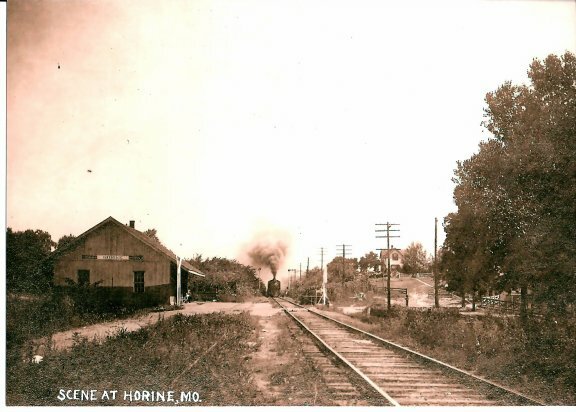 The railroad line in the photo is the current Union Pacific line that runs through Horine, south to DeSoto. It used to be the Missouri Pacific. (MOPAC) Freight cars loaded large bags from time to time. 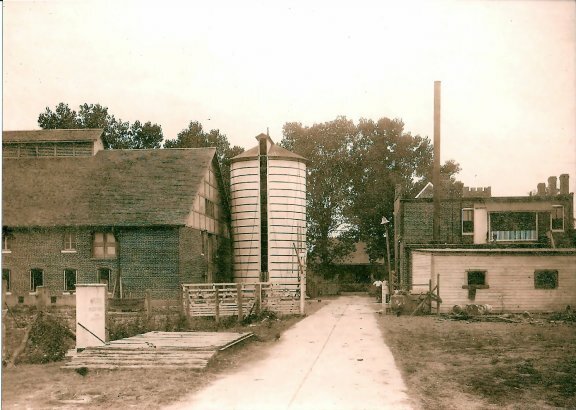 Hobos were allowed to sleep in the barn at the Luhn's as long as they gave Mr. Luhn their cigarettes so they wouldn't burn the barn down. They usually got a meal and a Gospel lesson. 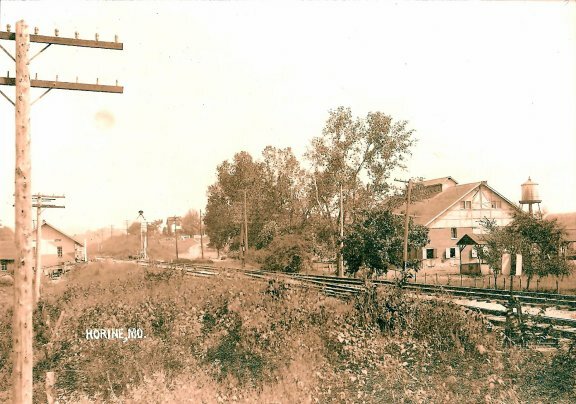 Only the Luhn house remains today.